Visit the studio in the video below of artist Leigh J. McCloskey who created a modern Tarot deck like no other – Tarot ReVISIONed. If anyone has seen and created a multi-dimension universe, it is McCloskey. I visited Leigh McCloskey at his studio several years ago and it is beyond imagining. His art is at one with the books, the walls, the floor, the ceiling – like walking into an alternate realm of existence. And don’t miss Leigh McCloskey, Chris Hopkins, Marcus Katz, Tali Goodwin, Melissae Lucia, Michael Robinson, David Shoemaker, Antero Alli, and me at the Tarosophy Tarot Convention in Sacramento CA on February 21-22. Information here. This is fascinating! Thank you for sharing. 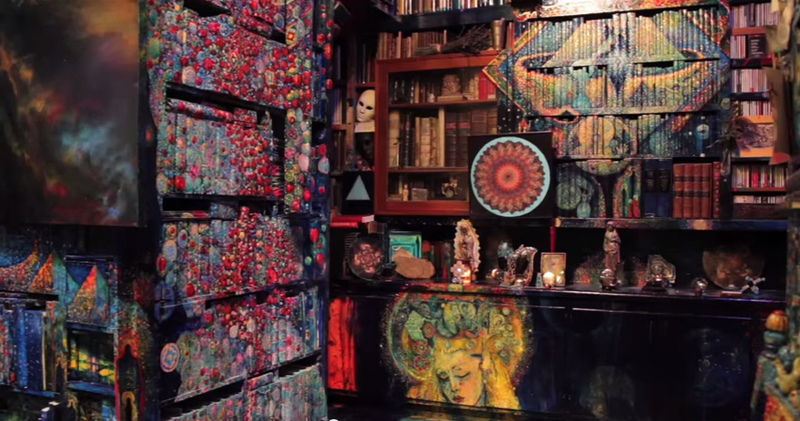 What an amazing studio – it’s so great to have these insights into artists’ creative spaces. I also hadn’t come across Leigh’s tarot before – I’m off to check it out! I have Leigh’s deck and the large format book. I remember his early acting days and saw him on TV three years ago. I made a special point of watching a series (Bones) that I never watch just so I could catch Leigh. But it’s his art that lingers in the mind. I was so happy to hear that he is joining you and getting out to speak about his deck. Candace – The Sacramento TarotCon has been cancelled. I’m surprised there is no notice of this at the website. It’s too bad because the lineup of presenters was incredible.